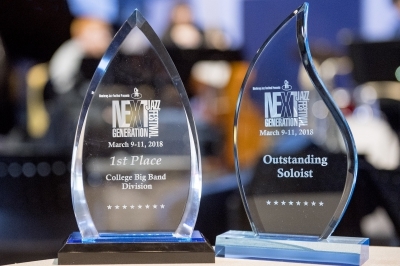 The University of Central Oklahoma School of Music’s Jazz Ensemble I, directed by Brian Gorrell, captured the attention of both judges and attendees at the 48th Annual Next Generation Jazz Festival, in Monterey, California, earning first place with their performance. The ensemble tied with the University of Denver Lamont Jazz Orchestra and beat out the University of Miami’s Frost School of Music Studio Jazz Band, in second place, and the Sacramento State Jazz University Ensemble, in third place. This year was UCO’s first visit to the festival. Central student and trombone soloist Evan Drumm, recently named Outstanding Collegiate Jazz Musician by the Oklahoma Jazz Educators, was recognized as one of only four “Outstanding Soloist” award recipients, for his improvised solo, earning a chance to perform at the Monterey competition. The ensemble, including Drumm, will showcase their award-winning talent in concert at 7 p.m. Thursday, March 29, with guest artist John Daversa, at the UCO Jazz Lab, 100 E. 5th St. in Edmond. The Next Generation Jazz Festival, presented by the Monterey Jazz Festival, is a weekend-long event that includes big bands, combos, vocal ensembles and individual musicians, vying for a spot on the stages of the 61st Annual Monterey Jazz Festival in September. According to organizers, the Monterey Jazz Festival is the longest continuously-running jazz festival in the world. The UCO College of Fine Arts and Design dean agrees. According to Gorrell, UCO Jazz has evolved from humble beginnings, starting as an extracurricular activity in the 1960s and has grown and matured into a nationally-respected jazz studies program. Since 1975, UCO jazz ensembles, combos and individual students have received numerous awards and honors for outstanding performances at events throughout the United States and Europe. With the addition of the UCO Jazz Lab, in 2002, the program began to experience real academic growth. A minor in jazz was added in 2004, as well as a Master of Music in jazz studies in 2006, under the direction of Gorrell as the new division head. For more information about Jazz Ensemble I in concert or to purchase tickets, visitwww.ucojazzlab.com or call the UCO Jazz Lab at (405) 974-2100. For a complete listing of UCO College of Fine Arts and Design events and performances, visitcfad.uco.edu.